Cazenovia students are part of a diverse yet close-knit campus community that fosters intellectual, social and ethical growth. Our small size and distinct blend of liberal arts and professional studies allows for individualized academic programs that are enhanced by internships and applied learning activities. Our welcoming community will make you feel at home in our small, safe campus and in the nearby lakeside Village of Cazenovia. Through The Cazenovia Commitment, accepted first-year students will receive merit scholarships from $15,000 - $22,000 regardless of family income and residency. The Cazenovia Commitment also includes small class sizes, an internship, faculty and alumni mentors, and opportunities to study abroad. 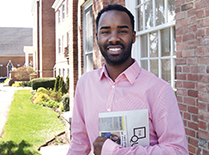 Register for an open house or schedule a personal interview and campus visit to learn about Cazenovia College and gain the first-hand knowledge necessary to make the best college decision. Visiting provides an opportunity to tour campus facilities, meet with an Admissions/Financial Aid Counselor and talk with students, faculty and staff. Our Admissions Office is located in Constable Hall at 3 Sullivan Street. We are open Monday through Friday from 8:30 a.m. to 5:00 p.m. with counselors available to answer questions you may have about Cazenovia College. The office is also open selected Saturday mornings throughout the academic year. Take a virtual tour of our campus guided by Marie Veschusio '17, assistant director of admissions. Watch the guided walking tour and explore our facilities. Our Financial Aid Office is prepared to assist parents, prospective and enrolled students with information concerning sources of financial assistance and application procedures. Whether you are a senior preparing to make your college decision, a junior just beginning your college search or a transfer student exploring colleges to complete your degree we invite you to visit us.